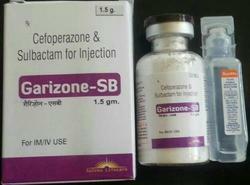 Our product range includes a wide range of esomeprazole 40 mg injections, ceftriaxone with salbactum injection, ceftriaxone sulbactam for injection, 1.5g cefoperazone salbatum, pcd ceftriaxone injections and pantoprazole 40 injection. Esomeprazole is the S-Isomer of Omeprazole and Reduces Gastric Acid Secretion Through a Specific Targeted Mechanism of Action. It is a Specific Inhibitor of the Acid Pump in the Parietal Cell. Both the R- and S-Isomer of Omeprazole Have Similar Pharmacodynamic Activity. 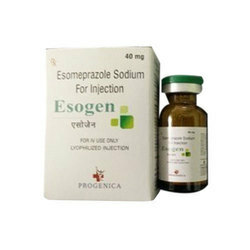 Esomeprazole is a Weak Base and is Concentrated and Converted to the Active Form in the Highly Acidic Environment of the Secretory Canaliculi of the Parietal Cell, Where It Inhibits the Enzyme H+k+-Atpase C the Acid Pump and Inhibits Both Basal and Stimulated Acid Secretion. Short-Term (4-8 Weeks) Treatment of Erosive Esophagitis; Maintaining Symptom Resolution and Healing of Erosive Esophagitis; Treatment of Symptomatic Gastroesophageal Reflux Disease; As Part of a Multidrug Regimen for Helicobacter Pylori Eradication in Patients With Duodenal Ulcer Disease (Active Or History of Within the Past 5 Years); Prevention of Gastric Ulcers Associated With Continuous Nsaid Therapy. The Recommended Adult Dose of Esomeprazole I.v is Either 20 Or 40 Mg Given Once Daily by Intravenous Injection (No Less Than 3 Minutes) Or Intravenous Infusion (10 to 30 Minutes). Esomeprazole I.v. Should Not Be Administered Concomitantly With Any Other Medications Through the Same Intravenous Site and Or Tubing. the Intravenous Line Should Always Be Flushed With Either 0.9% Sodium Chloride Injection, Usp, Lactated Ringer Injection, Usp Or 5% Dextrose Injection, Usp Both Prior to and After Administration of Esomeprazole I.v. for Injection. We Are Looking for Franchise Opportunities, Business Opportunities, Pharmaceutical Distributors, Pharmaceutical Marketing Services, Pharma Pcd & Pharma Franchise. 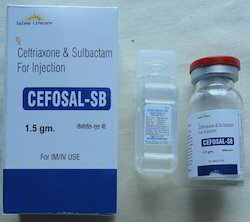 We are engaged in offering our clients a superior quality range of Ceftriaxone with Salbactum Injection. We are one of the prominent suppliers of a wide range of Pharmaceutical Drugs. Our wide range includes Capsule, Soft gels, Tablets and Syrups. These are acknowledged for salient features such as purity, environment-friendly and accurate composition. We welcome Qualified and experienced individuals as well as Corporates from Maharashtra to become our associates through PCD / Franchise. We offer to them good quality medicines at the most competitive rates in India. We are looking for franchisee of our products in MALDAH. 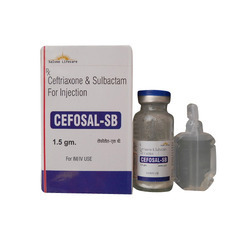 We have been known in the industry for the best quality range of Ceftriaxone Sulbactam for Injection. Keeping in mind the needs and requirements of the clients, we also have a customized packaging quantities of these products. These products are also tested as per the international standards of quality before being delivered to the esteemed clients. The combination of Cefoperazone sodium and Sulbactam sodium is indicated for the treatment of the following infections caused by susceptible organisms. Respiratory tract infections (Upper and Lower), Urinary Tract Infections, Peritonitis, Cholecystitis, Cholangitis and other intra-abdominal infections, Bacterial sinusitis, Meningitis, Skin and soft tissue infections, Bone and Joint infections, Pelvic Inflammatory disease - endometritis, gonorrhea and other infections of the genital tract. The usual adult dose of the combination is 2 to 4 g/day (i.e, 1-2 g/day each of Cefoperazone and Sulbactam) given IV or IM in equally divided doses every 12 hours.In severe or refractory infections the daily dosage may be increased to 8g (i.e, 4g/day each of Cefoperazone and Sulbactam) given IV in equally divided doses every 12 hours. The recommended maximum daily dosage of Sulbactam is 4g (8g of the combination).Dosage regimens should be adjusted in patients with the marked decrease in renal function. The usual dosage in children is 40-80mg/kg/day (20 to 40 mg/kg/day each of Cefoperazone and Sulbactam) every six to twelve hours. In serious or refractory infections, these dosages may be increased up to 160 mg/kg/idea of the combination. (i.e., 80 mg/kg/day each of Cefoperazone and Sulbactam) every six to twelve hours. Allergy to Penicillin or Cephalosporin. 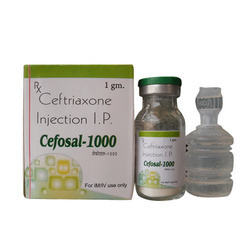 Since the time of our conception, we have been engaged in the manufacturing of a wide range of PCD Ceftriaxone Injections. These products are tested as per the international standards of quality. The customized packaging range of these products is highly appreciated by our esteemed clients. 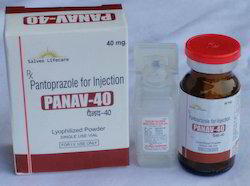 PANAV-40 INJ for Injection is supplied as a freeze-dried powder in a clear glass vial fitted with a rubber stopper and crimp seal containing Pantoprazole sodium, equivalent to 40 mg of pantoprazole. PANAV-40 INJ is indicated for the treatment of gastric ulcer, duodenal ulcer, moderate and severe reflux oesophagitis. PANAV-40 INJ is recommended only in cases where the oral administration is not indicated. The recommended dose is intravenous administration of the content of one vial ( 40 mg Pantoprazole ) once daily for 7 days. Duodenal Ulcers generally heal within 2 weeks. If a 2-week period of treatment is not sufficient, healing will be achieved in almost all cases within a further 2 weeks. Gastric Ulcer Gastro-oesophageal reflux: A 4 week period is usually required for the treatment of gastric ulcers gastro-oesophageal reflux. If this is not sufficient, healing will usually be achieved within a further 4 weeks. Elderly: No dose adjustment is necessary in the elders. Patients with Impaired Renal Function: No dose adjustment is necessary in patients with impaired renal function. Patients with Impaired Hepatic Function: In patients with severe liver impairments, the daily dose should be reduced to 20 mg Pantoprazole. Also, in these patients the liver enzymes should be monitored during PANAV-40 INJ therapy. In case of liver enzymes, it should be discontinued. This freshly prepared solution should be administered intravenously over 2 to 15 minutes, either as a slow injection or it may be further diluted with 100 ml of Sodium Chloride Injection BP 0.9 % w/v or 5% Glucose Injection and administered as a short term infusion. The duration of administration should be 2 to 15 minutes. The reconstituted solution must be used within 12 hours of preparation. Treatments with Pantoprazole can occasionally lead to headache or diarrhea. Rarely nausea/vomiting, abdominal pain, flatulence, constipation, allergic reactions such as skin rash and pruritus may occur. Individual cases of oedema, blurred vision, fever, dizziness, thrombophlebitis, depression or myalgia subsiding after termination of therapy have been reported. Presentation: PANAV-40 INJ is available as Box of one 10 ml vial with 10 ml Sodium Chloride Injection BP as diluent.